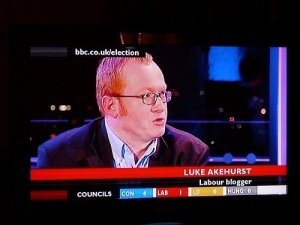 Luke Akehurst is the Director of We Believe in Israel a project of the pro Israel campaign group BICOM. Akehurst has been a Labour Party activist since 1988, and a staunch Blairite. Akehurst attended Kent College 1983 – 1990 and gained a BSc, Politics from the University of Bristol 1990 – 1993. He was National Secretary of Labour Students 1995-6; Organiser, Holborn & St Pancras CLP The Labour Party September 1996 – January 1998; Full-time Agent for Rt Hon Frank Dobson MP in the 1997 General Election;Labour Group Political Assistant London Borough of Hackney February 1998 – June 2000; Parliamentary candidate for Aldershot (2001) and Castle Point (2005), and from 2002, has been Hackney Councillor (Chatham Ward) and chief whip of Labour in the London borough 2002-9. Member of Labour’s NEC 2010-2012. Akehurst stepped down as a councillor at the local elections in May 2014, one of 18 Labour councillors in Hackney to do so. He was reportedly moving to Oxford with his family. Akehurst hinted on a LabourList blog that his departure from politics was not permanent, writing that he had 'perhaps temporarily' left 'public office'. Luke continues to serve longstanding clients such as Balfour Beatty, Finmeccanica and GKN plc with loyalty, efficiency, good humour, political intelligence and an encyclopaedic knowledge of facts and figures. Over the last year, he has won prestigious new clients such as support services giant Serco Group. He advised Shropshire County Council on achieving its bid to become a unitary council, and advised Devon and Suffolk County Councils on their successful campaigns, against the political odds, to fend off unitary bids by Exeter and Ipswich. Luke is often found offering counsel and tactical and strategic insight at the heart of some of the key issues in Whitehall and Westminster. Labour Party chair Hazel Blears is expected to announce her candidacy soon, and is understood to be receiving advice from Weber Shandwick director of public affairs Luke Akehurst. He has a Blog which has been spoofed. Member of Unite, the Co-Op Party and Fabian Society. Active trade unionist for 19 years – including seven years as a member of Amicus London Regional Political Committee. ↑ Josh Loeb, Labour Councillor Luke Akehurst Stands Down, Hackney Citizen, 17 April 2014, accessed 4 June 2014. This page was last modified on 4 June 2014, at 12:51.